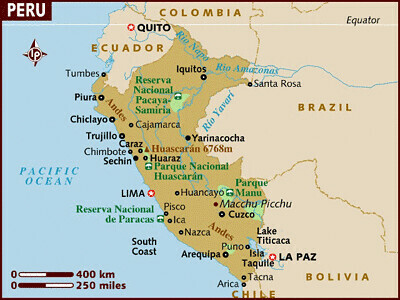 We will fly to Lima and stay there for one day. Then we will fly to Cusco (3300m or 10800 ft). In Cusco we will meet up with Jørgen, Kristina, Jon and Laura. Cusco will be our “base” for about a week. From there we will go to Machu Picchu (2400m or 7875 ft), Sacred Valley and Amazonas. The next stop wil be the city Puno and Lake Titicaca (3812m or 12507ft). We will stay there for three days. Then our trip will take us to Arequipa (2380m or 7740ft) and Colca Canyon. 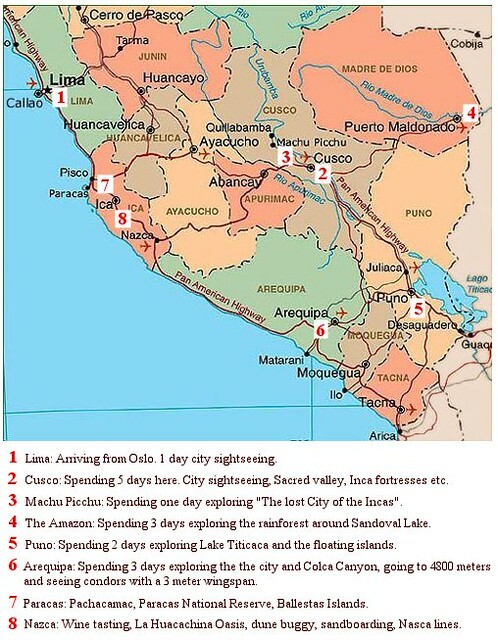 Then we will go back to Lima and go for a 3 day’s trip south of Lima to the Paracas Nature Reserve and the Nazca Lines. Skal bli spennende å følge med på enda en av turene deres. Jeg trøster meg med at Oslo er varmest på vær/temperatur oversikten deres akkurat nå;-) Kos dere masse! I wish you both a wonderful trip. Bring back lots of pictures and please be safe!